Passalacqua Ibis Redibis is relatively strong, with a slightly rough, but pleasant malty taste. Perfect for latte macchiato or cappuccino as it provides an excellent crema. Like all coffeeblends from Passalacqua including Ibis Redibis the coffeebeans are relatively dark roasted which is typical of southern Italy. This blend provides a relatively strong espresso with rich, intense flavor, so it is particularly well suited to be mixed with milk. 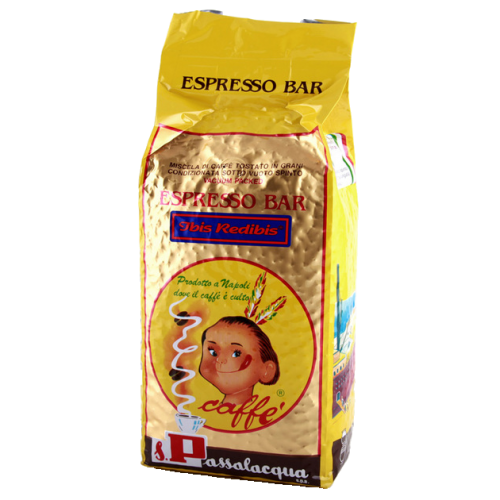 Passalacqua Ibis Redibis consists of 40% Robusta beans and 60% Arabica beans, which produces a wonderfully thick crema.